1. Jermaine Dye: Derrek Lee and Dye are apparently buddies, so obviously Dye would be super awesome, right? Dye got off to a hot start in 2009, but tanked in the last two months of the season. He can play a little first base, but watching an outfield of Soriano, Byrd, and Dye would be like watching your mom give Rush Limbaugh head. 2. Jonny Gomes: Gomes is intriguing. He's flashed some power in the past and isn't a horrible outfielder. He's also coming off of an injury, which I'm sure gives ol' Jimbo a sweet chubby. Of all the guys on this list, he could make the most impact, provided his 80 year old body doesn't fall apart. 3. Reed Johnson: Now that DeRosa is a Giant, his stalkers have turned their attention to Reed Johnson. 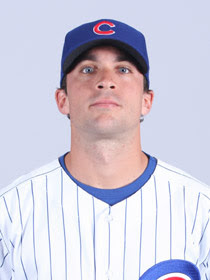 Reed's a cool guy and he certainly fills the Cubs' need for a guy who can grow facial hair between innings, but he's really not much of an upgrade over guys like Fuld. Unlike Fuld, however, Reed can actually hit the ball when there are runners on base, so he's got that going for him. 4. Jim Edmonds: This worked out once. I don't see it working out again. But hell, I thought Edmonds was finished when the Cubs signed him the last time and he proved me wrong. I still really want to hate him though, so I hope he doesn't come back. 5. Xavier Nady: Nady's coming off Tommy John surgery. If he were a mediocre pitcher, I'd say he was guaranteed to sign with the Cubs. We know how Hendry loves his reclamation projects. If he's healthy, he hits pretty good and he has a cool name. He could easily be the new DeRo for the Trixie set. 6. Marcus Thames: The former Tiger has some pop in his bat and can play the outfield and a little first base. He also strikes out a ton. The Cubs already had Craig Monroe once, they don't need him again. Pass. 7. Rocco Baldelli: This guy is still playing? Well, you can bet someone will be dumb enough to give him a contract. Let's just hope he's not a big fat white guy with the initials J.H. Sure Baldelli was on the Rays while Pinella was there, but he never actually played for Uncle Lou. He's the Mark Prior of outfielders. 8. Eric Byrnes: No. No-ho-ho. No. No. Of these eight mouth breathers, if I had to pick one, I would probably take a chance on Gomes. He hit .267 with 20 homeruns in 98 games with the Reds last year. By comparison, the Hoff hit .239 with 10 HRs in 105 games and although Fuld hit .299, he only managed 2 RBIs and one HR. Fuld is basically Ryan Freel without Farney in his head. And Ryan Theriot already owns the "scrappy white guy" mantle on this team. Also on Jim Hendry's to do list is sign yet another relief pitcher. A few years ago, this team was dripping with second baseman. Couldn't we get at least one guy who might be considered a starting 2B before we add another crappy pitcher? Just a thought. He is staring into my soul. Sorry, but what does this have to do with Michael Phelps?